Telling the truth about the events taking place in Syria before world public opinion is an uphill battle because the real agenda of the terrorism-backers who are seeking to destroy the Middle East, must remain unspeakable. This fact is clarified by Canadian author Mark Taliano, in his book entitled ‘Voices from Syria’ with a view to shedding light on the truth, refuting the lies, with a view to reaching global peace and destroying the cancer of terrorism. “The ‘Global War on Terrorism’ also known as the ‘war on Terror’ is a fraud. It is literally a global war for terror. Empire creates and uses extremist terrorist proxies, including ISIS (also called by its Arabic acronym, Daesh), to advance its geopolitical goals,” Taliano says in his book, indicating that the neoconservative “West” and its allies want to destroy the Middle East so that they can control it. FALSE: The Syrian war began when president Bashar al-Assad brutally put down peaceful protests. TRUE: The Syrian war was planned in earnest by the US since 2005. The Syrian soldiers and police were not even allowed to carry weapons until the ‘peaceful protesters’ had slaughtered several hundreds of police and soldiers. 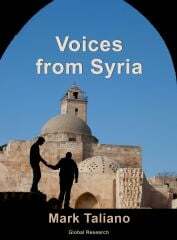 Scores of testimonies from Syrians, open-source western documents and historical memory are used by the Canadian author to prove that Syria, which refuses to be a vassal of US-led forces of predatory capitalism, is on the front line against the dictatorship of this globalizing economic ideology that favours the dominance of capital and markets over people and nation-state. Taliano says in the preface of his book (composed of 6 chapters) that the secular government of Syria is led by the elected president Bashar al-Assad, who is progressive and forward-looking. President al-Assad has earned the support of most Syrians by providing for them and by protecting them. Healthcare and education, including higher education, are free in Syria. Before the externally orchestrated and perpetrated war on Syria started, Syria was one of the safest countries in the world to visit. Testimonies from Syrians living in Syria affirm that what is happening in the country is neither revolution nor civil war. Everybody in Syria knows that Washington is the mastermind and the main planner of the war and it supports terrorists by all means. Those terrorists [ ISIS, al-Qaeda/ al-Nusra Front, White Helmets, Hayet Tahrir al-Sham HTS] are western proxies, none of them are moderate. They perpetrated hundreds of heinous crimes against Syrian civilians and in Syria. This is just one story out of hundreds of stories narrated by Syrians and obfuscated by Mainstream Media that has created a state of mass political imbecilisation amongst western media consumers. The western media serves as an agency for imperial war rather than as an agency for truth and justice, according to Taliano, who underlined that voices of truth, justice and peace are suppressed. Moreover, the Canadian author talked in his book about feigned humanitarianism as a cover for crimes of the highest order and western crimes against law and order. He referred to Canada’s contribution to the cause of the disease metastasizing overseas when it chooses to ally itself with the cancer rather than the cure. “The cancer is NATO and its allies, including Saudi Arabia, Qatar and Jordan. We are the countries funding the terrorists, and we are the cancer that wants to illegally impose regime change in Syria,” Taliano stresses, making comparison between Russia’s intervention to cure the terror disease in Syria and NATO countries’ intervention to enable and support terrorism in Syria. Not only Syria, but also Libya, Iraq and Ukraine have been infested with terrorists to destroy these countries and subjugate the population. For example in Syria, the western terrorists attacked 67 of the country’s 94 national hospitals between 2011 and 2013. The Canadian author mentioned a list of President al-Assad’ notable accomplishments since 2000. Among them we number: Construction and restoration of 10.000 mosques, 500 churches, 8000 schools, 2000 institutes, 40 universities besides development of tourism, public transportation. He, in addition, elaborated strategies used by colonizers to achieve their goals in the region. These strategies are starvation, indiscriminate bombing of civilian populations, illegal sanctions, and ‘divide and conquer’. Taliano underscored that genocidal corporate media presstitutes follow the all-too-familiar script of blaming the victim for the crimes perpetrated by aggressor nations as it creates war propaganda. He called for the need to build a consensus for truth, justice and peace, instead of building a consensus for war and first-strike nuclear attacks. “Historical memory teaches us that the dirty war against Syria is consistent with previous illegal wars of aggression and western-sourced evidence demonstrates beyond a reasonable doubt that we are, yet again, the terrorists,” Taliano says. All in all, “Voices from Syria” is a very interesting documentary book that includes clues about lies and crimes of western media against people in Syria, Libya, Ukraine, Iraq and beyond.